UK food wastage is nothing short of a scandal. The statistics as to just how much of our food goes to landfill are shocking to say the least. Yet despite these depressing figures, and regardless that supermarkets are still (for the most part) resisting pressure to transform their processes for the better, there are many un-sung heroes out there taking on this mammoth wastage challenge. The Shrewsbury Food Hub is one such organisation – and in this blog article we take a look at the ways in which they’ve been reducing food wastage in their local community, all whilst helping locals at the same time. “The UK creates more waste than any other country in the EU, dumping 14,000,000 tonnes a year – or twice as much food per capita as the EU average”. “This waste is split between producers, the supply chain, retail and households: Approx. 1/3 comes from producers and supply chain, whilst a further 1/3 comes from retail and, finally, the last 1/3 from households”. We discovered the Shrewsbury Food Hub at this year’s RWM Energy, Renewables and Water Show. Whilst listening to Katy Anderson (co-founder of the Shrewsbury Food Hub) we learnt about how much good work they’re doing in the food waste realm. So impressed were we, that we were inspired to share their story in a bid to involve others in their charitable efforts. “Our volunteers are food rescuers! We aim to cut down Shropshire’s food waste and show people that spare food is good food, by helping our community to re-use the surplus stocks from the local food industry”. The Shrewsbury Food Hub is powered by volunteers. Alongside other charities in their umbrella group, they help to feed people with the surplus food from supermarkets that would otherwise be thrown away. 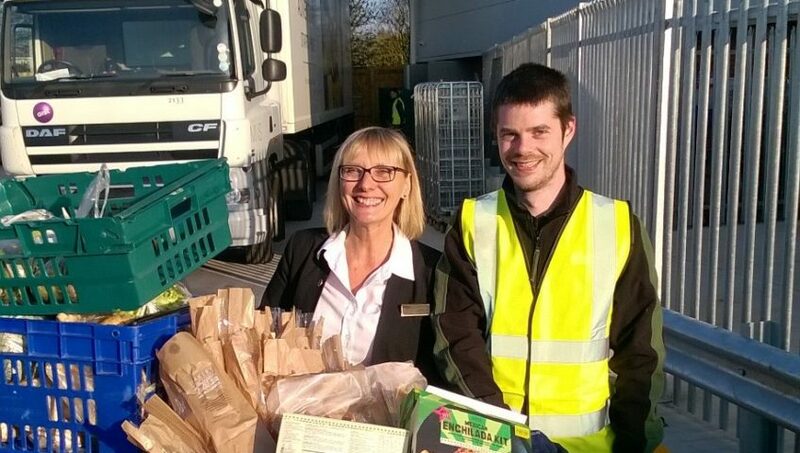 This process demands long days and nights – with the Food Hub gaining nightly updates from retailers throughout Shropshire as to whether, and how much, food waste they may have. Following night time collections, each morning they’ll distribute the collected food to various organisations, including the Shrewsbury Food Bank Plus, Shrewsbury Ark, Riversway Natterbox Cafe, The Severn Hospice, Grange Primary Breakfast Club, Meole Brace Primary Breakfast Club, Greenacres Primary, Harlescott Junior and Coleham Primary breakfast and after school clubs. Helping them in their mission are Marks & Spencer’s and Sainsbury’s, however The Food Hub is always looking out for new partners – such as retailers, caterers, events and restaurants. If you fall into one of these categories, get in touch with the Food Hub to find out whether you could contribute food that would otherwise be sent straight to landfill.